Hiking Tents - A question, what is the best? Stumbled across your blog today – well done, there’s some really good info there. I’ve been wandering around the internet trying to get an idea of what sort of tent is best for the Overland Track (in Autumn) – 3 season, 4 season, etc. Do you have any suggestions? Thanks for the question Dave. Just be aware this information is from pretty limited experience with buying hiking tents and using them in REALLY extreme weather. We have been camping for 30 years plus so we know what makes a quality tent and the features we believe you should look out for but have limited experience in really bad Tasmanian weather. What we can describe is what type of tent we have and a few tips that should give you some knowledge to make an informed decision. We have a Storm Shelter 2 Tent from Snowgum. There is an EXCELLENT gear review here . It is rated as a Four Season (but below the snow line….what ever that means) The Storm Shelter is a dome, which we like as there is plenty of head space inside the tent. Our friends must have been happy with our choice, as four of them have the identical tent. Check out this post, that has a picture of three of them on the beach at Echo Point Hut, Lake St Clair! We think that Snowgum has stopped manufacturing these tents, which is a real shame. They don’t appear on their current catalogue. Back to the Overland Track. Every recommended campsite has a hut and tent platforms. 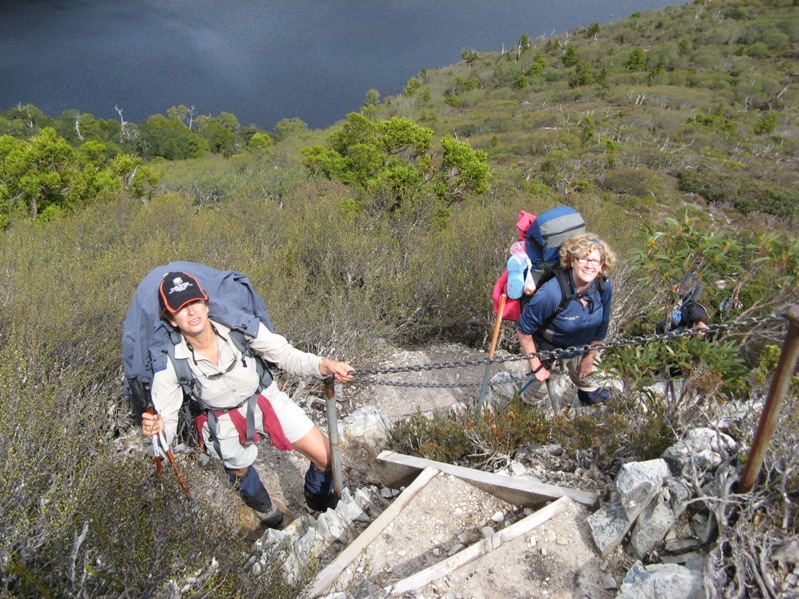 The facilities are excellent for hikers to either stay in the hut or camp on a dry, flat platform. Parks have deliberately developed infrastructure in these areas to reduce the impact of the 1000’s of people who pass through each year. The picture below is of us in February camped on one of the platforms at Kia Ora Hut. There is usually plenty of space and enough platforms to meet demand. A simple suggestion to help you set up your tent on the platform is to take a few heavy rubber bands. The platforms either have a crappy wire setup where you attach your fly etc or nails in the sides of the boards to hook your fly ties onto. This is the best option and seems to be the way the Parks people are going. We have found by adding a couple of rubber bands, as required to your ties, you can set up the fly with the correct tension. Handy if it is poring rain and you want to get your fly tensioned properly! One other thing we always take is a groundsheet for the tent. We just use black poly sheeting cut to be just smaller than the tent “foot print”. Cheap and light while strong enough to protect the tent floor and gives us a simple floor in the vestibule for our pack and boots. When we were down there in July we slept in our tent most nights. We were surprised by the number of people who were hiking and while the huts were not crowded, we enjoyed the quietness of the tent and the undisturbed sleep. Pelion Hut was the only exception where , due to it’s size, our party was able to nab a whole room to ourselves. Clare , our daughter, ended up sleeping on the veranda due to snoring that came from an “unknown source”. Just another word of warning about possums around the campsites. They can smell food in a pack from 100 metres. We (and most people) put our packs in the hut each night. We have seen a brand new tent shredded by a hungry possum who ripped its way into the tent and then ripped its way out when the startled occupent woke up to find the possum sitting on him eating a Mars Bar!! Have a great trip! I cannot see a date on your posting. It would be helpful to include a date so we know how long ago you made your comments. For example, the Storm Shelter tent is still on Snowgum’s web site, so was your post a long time ago and it has come back, or is it due to disappear soon? Thanks for the comment. Agree re the date, will try and sort it out! It was written in 2007. I checked out the Snowgum website and the Storm Shelter is still there BUT it is out of stock. I have my suspicions they don’t have them any more and have just not updated their website. 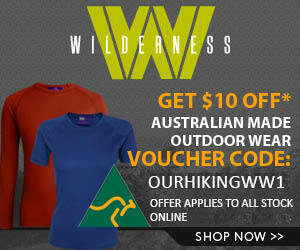 I have not seen them for sale in a Snowgum store and would grab abnother one if I saw it!